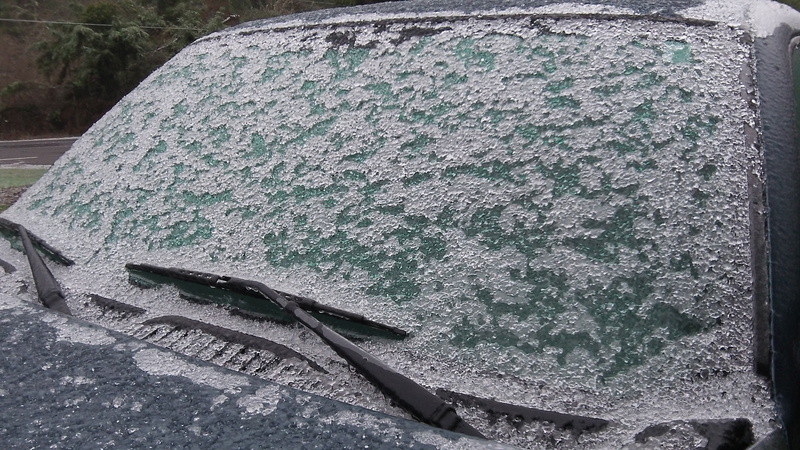 Frozen sleet on a mid-valley windshield: I obviously didn’t drive to Eastern Oregon to get a shot for this story. On social media, someone wanted to know why the media aren’t saying “terrorists” when they talk of the people who took over buildings at the Malheur Wildlife Refuge. The answer is simple. Terrorists they’re not. The object of terror is to terrorize the population for political ends. Terror on behalf of Algerian independence in the 1050s comes to mind. Or modern-day bombings to change American policy in Vietnam 45 years ago or in the Middle East today. Nobody is terrorized by events in Harney County. There has been no violence, and the protagonists say they don’t want any. No one has been hurt and the public has not been inconvenienced. That’s one difference between the Malheur activists and the protesters who last year stopped traffic in cities including Corvallis, or those who dangled themselves from a Portland bridge to stop a ship. The Malheur demonstration is doomed. The activists’ goal will not be reached. The U.S. government will not close the wildlife refuge and distribute its land to any ranchers. But the action is not without result. Because of it, more Americans now are aware of how unfair and vindictive the U.S. government can become when crossed by individual citizens. After a long history of conflict between the Hammond ranch and federal land managers, the ranch family’s father and son were convicted or setting fire to improve range land, in one case, and prevent a wildfire from destroying their ranch in the second. But they were prosecuted under a law intended to deter domestic terrorism. The judge properly reasoned that five years in prison as required under that law was unconstitutionally harsh for two men who had no evil intent, so they served lesser terms. But a U.S. attorney for Oregon, who has since resigned because of apparent personal problems, appealed the lower sentences, and the Ninth Circuit said they must serve the terms demanded by the anti-terror law. Now they are back in federal prison. What about the fire that was set to cover up the poaching ??? I belive the Bundy’s are trying to find a reason to make a fight. I’m just a silly Albany girl… that’s done a little research. I don’t have any answers, but I think there is too much publicity to this and it’s hiding what Obama is doing tomorrow. Hogwash! It’s not “their” land. They were turned in by their own family, who testified to the poaching as the cause for the arson.. Read the overview of this case that was tried before a jury in Pendleton and they were found guilty. Before people dismiss these arsonists as patriots, you should remember that three firefighters were killed in Washington near Twisp last August in the big fires. The Hammond’s started at least one of their arsons when a burn ban was in effect and fire crews were already in the area battling fires. I have been reading some detailed information on-line concerning the harassment the Hammonds have endured over the years from the BLM and the Fish and Wildlife Service. Thanks for bringing it up in your blog also. The situation with the Hammonds and how they have been treated by government bureaucrats is extremely upsetting. And to be tried as terrorists? Talk about bureaucrats out of control. Oh, I almost forgot, they are here to protect us. Personally, I think the Feds should simply cut the power & water, wait and do nothing. When those folks finally do leave (and they will), check the building for any damage… The sooner the media totally ignores them, the better off we’ll all be. It’s been interesting to read and work to understand the views of the different parties involved in this. My bottom line is that I would not wish for out of state interests to represent me, and I am not at all convinced that I share a common goal with then regarding land use or “ownership”. I read that the local schools are closed for the week. No reason was given, but that seems like it could be inconvenient for those affected. The two Hammonds now in prison in Calif. were threatened with death along with their family and any supporters so they went “peacefully”. In short this is all about land. The government wants it, to the tune of displacing 300 to 400 ranchers in Oregon. the govt. wants to turn it into a park approx. double the size of Yellowstone. If the govt controls the land they control the people – through land for food and water. Besides, if given a good reason to call in the military — U.N. military — Obama can postpone or cancel the election..
Common themes of corruption and abuses of authority are the norm now and anyone who stands up to point them out are labeled and demonized so as to discredit their whistleblowing. The vindictiveness outlined in the events themselves speaks volumes as to the nefarious goals of those involved. No different than what happens here in this very City. The Hammond’s have been abused by our federal government at the very least. Had a fire spread to federal land and caused damage they could have been prosecuted for not using due diligence to prevent such. If there was poaching it was not presented. That was a smokescreen to give the public fear of the Hammond renegades. They already served their time (which was unfair and unjust). The current powers in Washington D C do not like conservatives and are flexing their power using the Hammond’s. They are collateral damage. It is flat out wrong for them to serve 6 months and 6 years more. The Bundy’s from Nevada may be trying to bring attention to the Hammond situation. They have done well there. They have sort of merged with Gun’s Rights groups. Those are separate situations that don’t assist the Hammond’s really and may even hurt. The Bundy’s have been a thorn in the side of governments powers for some time. The place taken over was not used. I don’t believe power was on. The occupiers brought everything they need and more. Once the government gets the public think these people are terrorist they get support without proof. Farmers and Ranchers in Eastern Oregon have very little help or say in State or Federal affairs. They are not treated fairly. Eastern Linn County residents often feel that way too. The Hammond’s should be released and compensated. Gun Right’s advocates are losing as Obama prepares to depart. The Bundy group should come and support and leave. But that does not get the media attention. The ‘standoff’ is bringing that on. Law Enforcement is waiting for them to leave which they will unless any one person gets an itchy finger. The key here is that these people openly brandished firearms and publicly declared their willingness to use force to insure their seizure of public property unless their demands are met. That is a common theme of these self-styled militias, in that they openly call for training and the use of weapons to secure what they believe is the proper functioning of government. The protesters stopping traffic in Corvallis, or dangling from the bridge in Portland, were not armed, and did not threaten to kill people to get their way. ALL of us should understand the real and serious threat portrayed by armed groups threatening to kill in order to get their way. “If two or more persons in any State or Territory, or in any place subject to the jurisdiction of the United States, conspire to overthrow, put down, or to destroy BY FORCE the Government of the United States, or to levy WAR against them, or to oppose BY FORCE the authority thereof, or BY FORCE force to prevent, hinder, or delay the execution of any law of the United States, or BY FORCE to seize, take, or possess any property of the United States contrary to the authority thereof, they shall each be fined under this title or imprisoned not more than twenty years, or both”. This shows the problem with MANDATORY minimum sentences. The judge in the judge in the original trial gave a lesser sentence but clearly violated the law in doing so. The federal prosecutor appealed because they are required to uphold the law as written by Congress, and the appeals court said mandatory means mandatory. On further appeal the Supreme Court refused to consider the case. Mandatory minimum sentences stink. Judges should always have discretion on sentencing, but the “tough on crime” folks don’t like that. As a member of the great “Union of Sovereign States” Oregon has a fundamental complaint. The Harney county events are symbolic of the fact that Oregon, along with few others, is a second rate state, as half of our land belongs to the federal government. It’s about time for our state government to look beyond their pension rights and demand to be left alone with our sovereign property. It doesn’t belong “to the federal government” it belongs to us, ALL of us, that are citizens of the United States, not just people who happen to live in Oregon. WE are the federal government, state government and local government. And we disagree among ourselves over the management of the land we all own. We manage those disagreements by voting for our representatives. It is easy to see where people get their news. People who get their news from opb type places see a rogue family getting freebies, People who get their news from sources from the middle and right see a rogue federal government a/la janet reno………. I do not know which is actually true cause I am not there……… but a few facts are in order, the Hammonds bought 8000 acres in the ;1980’s, got water rights from the state, used county roads which the feds said they couldn’t and then were held up in court in favor of them using the county roads, had the federal government fence off the water that the Hammonds had gotten water rights to from the state of Oregon. There are enough facts from many places, to warrant a close look from someone outside the two groups disagreeing, but the feds make a charge, they then act on it and when they are found to be wrong, no one goes to jail….. ever…….. it is time for people to accept responsibility and suffer the consequences, if the Hammonds are wrong for setting backfires, then the federal government should have to pay for the damage to the Hammond’s property that would have occurred if the backfire had not been set to stop the fire coming off of federal land. If it is found that federal employees did illegal things if done by others would result in jail time, then the public employees should go to jail as well.. Interesting discussion precedes this comment. There are a few errors. Land ownership in the West has interesting origins. Folks from France, Spain, Russia walked in, said “this is mine” and proceeded to use the land for profit. At various points, the Federal Government acquired title by treaty and/or sale. For the most part the land was empty of population. The carrying capacity was too low to support much. Settlers were allowed to establish title to land, provided they made specific improvements. Local and regional governments grew “organically” out of the need for law and order. The Federals eventually established Territories and States while retaining land title. Part of what seems to be bothering folks most is that they don’t like the restrictions that BLM, USFS, etc place on their use of Federal-owned land. Grazing limits came about to stop the deleterious effects of over-grazing. Timber harvesting limits ultimately came about because the forests were overcut and not replanted. It seems that the folks occupying the Malheur Visitor Center wish to return to pre-Territory use of land. That ship has sailed. They are allowed to voice their opinion and work through lawful channels for change. I don’t have to agree with or accommodate them.